Frank Capra’s “Mr. Smith Goes to Washington” is going to be the big movie explosion of the year, and reviewers are going to think twice and think sourly before they’ll want to put it down for the clumsy and irritating thing it is. It is a mixture of tough, factual patter about congressional cloakrooms and pressure groups, and a naïve but shameless hooraw for the American relic—Parson Weems at a flag-raising. It seems just the time for it, just the time of excitement when a barker in good voice could mount the tub, point toward the flag, say ubbuh-ubbah-ubbah and a pluribus union? and the windows would shake. But where all this time is Director Capra? I’m afraid Mr. Capra began to leave this world at some point during the production of “Mr. Deeds Goes to Town,” his best picture. Among those who admired him from the start I know only Alistair Cooke who called the turn when “Deeds” came out. Writing in England, Cooke confessed to “an uneasy feeling he’s on his way out. He’s started to make movies about themes instead of people.” When “Lost Horizon” appeared, I thought our Mr. Capra was only out to lunch, but Cooke had it. “You Can Take It with You” in the following year(1938) made it pretty evident that Capra had forgotten about people for good. He had found out about thought and was going up into the clouds to think some. From now on, his continued boxoffice triumph and the air up there being what they are, he is a sure thing to stay, banking checks, reading Variety and occasionally getting overcast and raining on us. Well, he was a great guy. “Mr. Smith Goes to Washington” is the story of how a leader of Boy Rangers was sent to the Senate by the state political machine because be was popular, honest and dumb. Washington is a shrine to him. So as be gawps around lost for a whole day, throw in thousands of feet of what can only be called a montagasm, buildings, monuments, statues, immortal catch-phrases in stone. But before we go any farther, what’s the payoff? It is that this priceless boy scout grew up as the son of a small-town editor so staunchly against the interests that they shot him for it under the boy’s nose; after which he read American history so widely and fiercely that he knew the Constitution and the cherry tree by heart. The story goes farther, of course, more than two hours’ worth. The boy thinks he falls in love, and then falls in love without thinking so. From these personal relations he learns that he has been a chump. 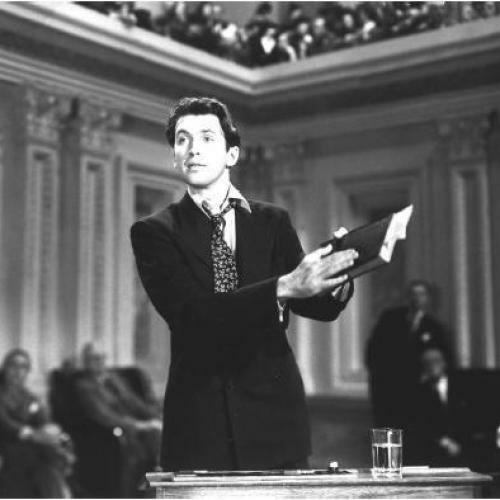 He starts a filibuster (the honest-man-in-court scene Capra has found so successful he won’t be without it) in which he says some fine things for liberty and the better world. And it is so harrowing on all concerned that just after he passes out his colleague shoots himself, and the American way is straight again. Politically, the story is eyewash. The machinery of the Senate and the machinery of how it may be used to advantage is shown better than it ever has been. But the main surviving idea is that one scout leader who knows the Gettysburg address by heart but wouldn’t possibly be hired to mow your lawn can throw passionate faith into the balance and by God we’ve got a fine free country to live in again. There are some fine lines and there is a whole magazine of nice types; but the occasional humor is dispersed and the people are embarrassed by just the slugging, unimaginative sort of direction that Capra became famous for avoiding. When the hero is supposed to be made innocent, they write him down an utter fool; when there is supposed to be evil, wickedness triumphs as slick as pushing a button. James Stewart was made fairly ridiculous; Jean Arthur couldn’t be; Edward Arnold, Thomas Mitchell and Eugene Pallette also withstood all such assaults. Claude Rains for once was just right for the part, and Harry Carey was there, fine as ever. But it was everybody for himself, which is a hell of a state of things in movies. The only good sequence was the lovely bit where Miss Arthur and friend get very tight by degrees, and by degrees more reckless and tearful, until they weave up to tell little boy blue that somebody swiped his horn. This seems a case of winning by a lapse; it is like the old Capra, and pretty lonesome.